We are proud to provide our patients with high quality orthodontic care and cosmetic dentistry to give them the smile they've always wanted. Having a healthier smile sometimes means needing to have a straighter smile. Misaligned, crowded teeth can lead to oral health complications because of wear or the fact that teeth are too difficult to keep clean. Correcting the alignment of your teeth can help you have a healthier smile while also feeling great about the way it looks. Dr. Sarah Thompson offers flexible orthodontic options to help patients of all ages correct their smile. 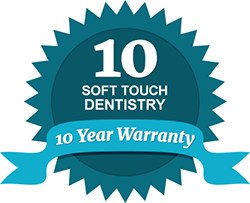 Whether you’re a teen or an adult, Soft Touch Dentistry has something for everyone. You’re never too old for braces! Many of our patients come to us wanting straighter smiles because orthodontic treatment was never an option for them growing up. With clear and fast orthodontic options, we’re putting smiles on faces from all walks of life. Soft Touch Dentistry is an Invisalign and ClearCorrect braces provider. What makes these particular options so unique? Both Invisalign and ClearCorrect use clear, “invisible” alignment trays to correct the position of your teeth. Each set of aligners moves your teeth without the need of brackets and wires. This makes the braces more comfortable and your oral hygiene easier to manage as well. Simply remove the aligners for brushing or during meals! Change your aligners out every 2-3 weeks to progress your tooth movement until the treatment is complete. Dr. Thompson will intermittently check the progress of your treatment every 6-8 weeks during a short visit in our office. We send several aligners home with you at a time, so you spend less time here in our office! Which type of braces is right for you? Contact us today to find out whether Invisalign or ClearCorrect orthodontics is best for your smile needs.